Dear EarthTalk: Is it bad for the environment to dump clog removers like Drano down the drain? What are some alternatives to such products? The active ingredient in Drano and other conventional drain cleaners is sodium hydroxide, otherwise known as caustic soda or lye. It is a man-made chemical used for its corrosive properties. According to the federal Agency for Toxic Substances and Disease Registry, the substance is not considered a pollutant per se, as it separates into relatively harmless component elements once released into water or moist soil. But sodium hydroxide is an irritant that can burn skin and aggravate nose, throat and respiratory airways, so contact with it is best avoided. If ingested outright it will likely induce vomiting, as well as cause chest or abdominal pain and make swallowing difficult—so keep it well out of the reach of children. For those who would rather avoid such chemicals entirely, safer alternatives do exist. A plunger or mechanical drain snake—along with a little elbow grease—can often free up clogs as well or better than sodium hydroxide compounds. One home remedy with a proven track record is to pour a handful of baking soda mixed with a half cup of vinegar down the drain, and follow it quickly with boiling water. Another option is to choose any number of enzymatic biological drain cleaners on the market today, such as Earth Friendly Products" Enzyme Drain Cleaner or Bi-O-Kleen’s BacOut. These make use of a natural bacterial and enzyme mixture to open and keep drains clear. And unlike sodium hydroxide they are non-caustic and will not facilitate combustion. As any plumber will tell you, a good maintenance regimen is the best way to prevent clogged drains. Flushing drains weekly with boiling water can help keep them clear. Also, installing small screens atop drains will help keep hair, lint and other clogging elements out of the pipeline in the first place. CONTACTS: Agency for Toxic Substances and Disease Registry, www.atsdr.cdc.gov; Earth Friendly Products, www.ecos.com; Bi-O-Kleen, www.bi-o-kleen.com. 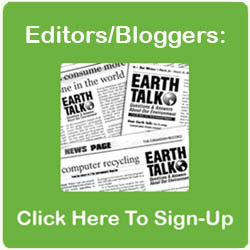 Dear EarthTalk: What have been the environmental consequences of the Iraq War? According to a report by the international environmental organization Greenpeace, the ecological damage from the 1990s Gulf War was "unprecedented." More than two-dozen chemical, biological and possibly nuclear facilities were destroyed or badly damaged, dispersing airborne toxins over hundreds of surrounding miles. Bombing and troop movements ruined hundreds of square miles of fragile desert surface, while land mines killed and maimed not only humans but also many thousands of wild animals. A United Nations mission in March 1991 found nearly half of Kuwait’s 1,330 active oil wells ablaze, releasing acrid smoke that spread hundreds of miles, causing substantial amounts of ensuing acid rain as well as respiratory and carcinogenic effects in humans accordingly. Many other wells were gushing oil: Some eight million barrels reached coastlines, and as many as 150 million barrels spilled onto the ground. Fast forward to the present Iraq War: The U.S. military focused on securing Iraq’s oil wells at the outset, in light of past experience, and was more concerned about the potential environmental destruction from the release of chemical and biological agents or the detonation of weapons of mass destruction. But while such fears proved unfounded, Iraqi citizens—not to mention allied soldiers—could suffer for decades to come from the effects of the use of weapons containing depleted uranium. Depleted uranium (DU) is a waste product of uranium enrichment for the production of nuclear fuel and weapons. Its density and high melting point make DU useful in various kinds of munitions, especially because it can penetrate tank armor. For the same reasons, it is also used in tank armor itself. But when such munitions are expended into the field, the substance sticks around and can contaminate food and water supplies and surrounding landscapes. (The actual radiation given off by DU is slight, and not likely to cause any distress.) Human health effects linked to DU exposure include kidney damage, lung cancer and leukemia, although conclusive studies have not yet been conducted. An International Commission to Ban Uranium Weapons was formed in 2003 to try to convince military leaders to stop using DU. The group is currently collecting signatures for its online petition calling for a comprehensive prohibition on the production, possession and sale of DU weaponry. Some 190,000 sympathizers have signed on so far. In a rare bit of good news from Iraq (environmental or otherwise), the country’s ancient marshlands, which were drained by Saddam Hussein in the 1990s as punishment against their occupants (most of the area’s 450,000 Shi"ite inhabitants had to flee), are back to almost 40 percent of their former level, according to the United Nations Environment Programme (UNEP). Since Saddam Hussein’s fall from power, the marshes have recovered at what researchers term a "phenomenal" rate. CONTACTS: Greenpeace, www.greenpeace.org; International Coalition to Ban Uranium Weapons, www.bandepleteduranium.org.